This page has been translated into Russian, Chinese, and Korean. In this mini-series I will explain how viewports and the widths of various important elements work, such as the <html> element, as well as the window and the screen. This page is about the desktop browsers, and its sole purpose is to set the stage for a similar discussion of the mobile browsers. Most web developers will already intuitively understand most desktop concepts. On mobile we’ll find the same concepts, but more complicated, and a prior discussion on terms everybody already knows will greatly help your understanding of the mobile browsers. The first concept you need to understand is CSS pixels, and the difference with device pixels. Device pixels are the kind of pixels we intuitively assume to be “right.” These pixels give the formal resolution of whichever device you’re working on, and can (in general) be read out from screen.width/height. 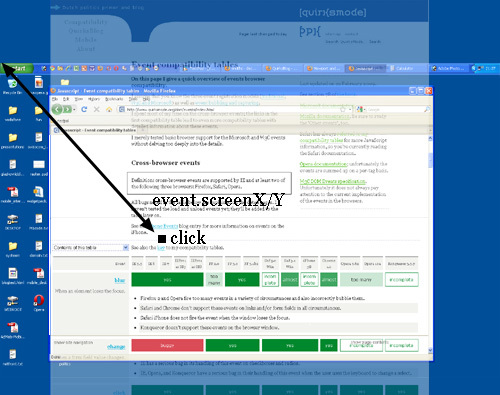 If you give a certain element a width: 128px, and your monitor is 1024px wide, and you maximise your browser screen, the element would fit on your monitor eight times (roughly; let’s ignore the tricky bits for now). If the user zooms, however, this calculation is going to change. If the user zooms to 200%, your element with width: 128px will fit only four times on his 1024px wide monitor. Zooming as implemented in modern browsers consists of nothing more than “stretching up” pixels. That is, the width of the element is not changed from 128 to 256 pixels; instead the actual pixels are doubled in size. Formally, the element still has a width of 128 CSS pixels, even though it happens to take the space of 256 device pixels. In other words, zooming to 200% makes one CSS pixel grow to four times the size of one device pixels. (Two times the width, two times the height, yields four times in total). A few images will clarify the concept. Here are four pixels on 100% zoom level. Nothing much to see here; CSS pixels fully overlap with device pixels. Now let’s zoom out. The CSS pixels start to shrink, meaning that one device pixel now overlaps several CSS pixels. If you zoom in, the opposite happens. The CSS pixels start to grow, and now one CSS pixels overlaps several device pixels. The point here is that you are only interested in CSS pixels. It’s those pixels that dictate how your style sheet is rendered. Device pixels are almost entirely useless to you. Not to the user; the user will zoom the page in or out until he can comfortably read it. However, that zooming level doesn’t matter to you. The browser will automatically make sure that your CSS layout is stretched up or squeezed in. At zoom level 100% one CSS pixel is exactly equal to one device pixel. The concept of 100% zoom is very useful in the explanations that are going to follow, but you shouldn’t overly worry about it in your daily work. On desktop you will generally test your sites in 100% zoom, but even if the user zooms in or out the magic of CSS pixels will make sure that your layout retains the same ratios. Total size of the user’s screen. 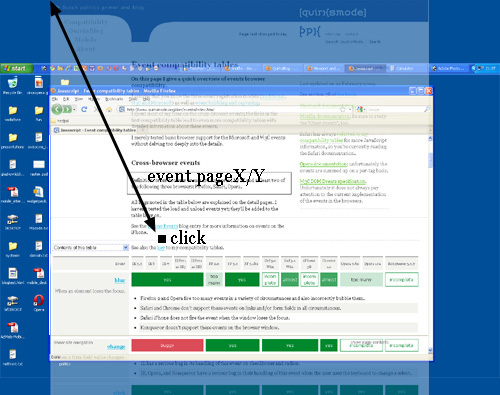 IE8 measures it in CSS pixels, in both IE7 and IE8 mode. Let’s take a look at some practical measurements. We’ll start with screen.width and screen.height. They contain the total width and height of the user’s screen. These dimensions are measured in device pixels because they never change: they’re a feature of the monitor, and not of the browser. Fun! But what do we do with this information? Basically, nothing. The user’s monitor size is unimportant to us — well, unless you want to measure it for use in a web statistics database. Total size of the browser window, including scrollbars. Opera measures it in device pixels. Instead, what you want to know is the inner dimensions of the browser window. That tells you exactly how much space the user currently has available for your CSS layout. You can find these dimensions in window.innerWidth and window.innerHeight. Obviously, the inner width of the window is measured in CSS pixels. You need to know how much of your layout you can squeeze into the browser window, and that amount decreases as the user zooms in. So if the user zooms in you get less available space in the window, and window.innerWidth/Height reflect that by decreasing. Scrolling offset of the page. 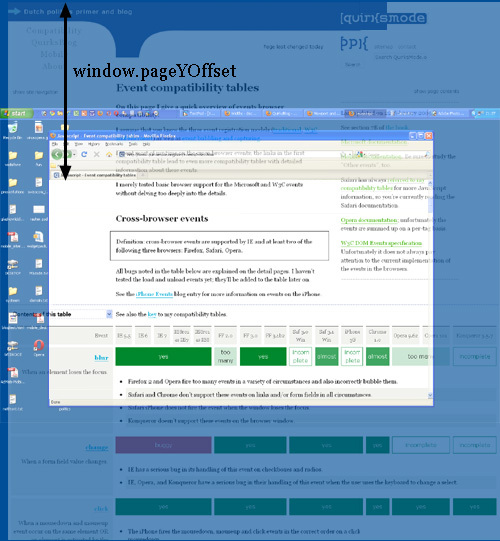 window.pageXOffset and window.pageYOffset, contain the horizontal and vertical scrolling offsets of the document. Thus you can find out how much the user has scrolled. These properties are measured in CSS pixels, too. You want to know how much of the document has already been scrolled up, whatever zoom state it’s in. 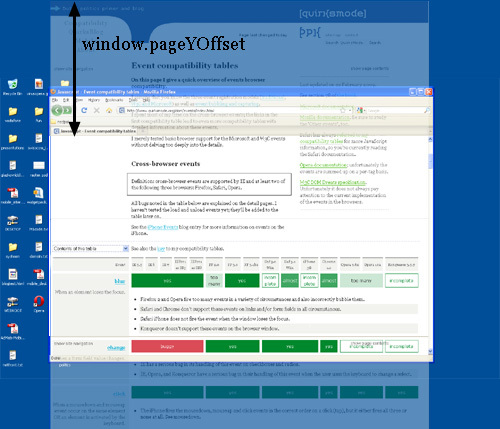 In theory, if the user scrolls up and then zooms in, window.pageX/YOffset will change. However, the browsers try to keep web pages consistent by keeping the same element at the top of the visible page when the user zooms. That doesn’t always work perfectly, but it means that in practice window.pageX/YOffset doesn’t really change: the number of CSS pixels that have been scrolled out of the window remains (roughly) the same. The function of the viewport is to constrain the <html> element, which is the uppermost containing block of your site. That may sound a bit vague, so here’s a practical example. Suppose you have a liquid layout and one of your sidebars has width: 10%. Now the sidebar neatly grows and shrinks as you resize the browser window. But exactly how does that work? Technically, what happens is that the sidebar gets 10% of the width of its parent. Let’s say that’s the <body> (and that you haven’t given it a width). So the question becomes which width the <body> has. Normally, all block-level elements take 100% of the width of their parent (there are exceptions, but let’s ignore them for now). So the <body> is as wide as its parent, the <html> element. And how wide is the <html> element? Why, it’s as wide as the browser window. That’s why your sidebar with width: 10% will span 10% of the entire browser window. All web developers intuitively know and use this fact. What you may not know is how this works in theory. In theory, the width of the <html> element is restricted by the width of the viewport. The <html> element takes 100% of the width of that viewport. The viewport, in turn, is exactly equal to the browser window: it’s been defined as such. The viewport is not an HTML construct, so you cannot influence it by CSS. It just has the width and height of the browser window — on desktop. On mobile it’s quite a bit more complicated. This state of affairs has some curious consequences. You can see one of them right here on this site. Scroll all the way up to the top, and zoom in two or three steps so that the content of this site spills out of the browser window. Now scroll to the right, and you’ll see that the blue bar at the top of the site doesn’t line up properly any more. This behaviour is a consequence of how the viewport is defined. I gave the blue bar at the top a width: 100%. 100% of what? Of the <html> element, which is as wide as the viewport, which is as wide as the browser window. Point is: while this works fine at 100% zoom, now that we’ve zoomed in the viewport has become smaller than the total width of my site. In itself that doesn’t matter, the content now spills out of the <html> element, but that element has overflow: visible, which means that the spilled-out content will be shown in any case. But the blue bar doesn’t spill out. I gave it a width: 100%, after all, and the browsers obey by giving it the width of the viewport. They don’t care that that width is now too narrow. What I really need to know is how wide the total content of the page is, including the bits that “stick out.” As far as I know it’s not possible to find that value (well, unless you calculate the individual widths and margins of all elements on the page, but that’s error-prone, to put it mildly). Browser vendors, what do you think? You might want to know the dimensions of the viewport. 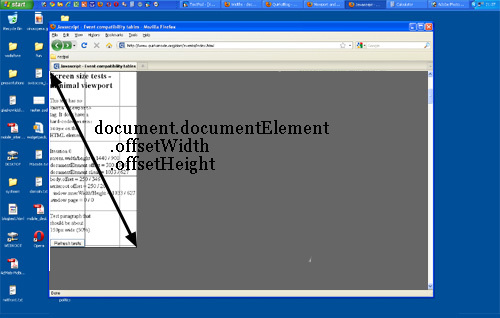 They can be found in document.documentElement.clientWidth and -Height. 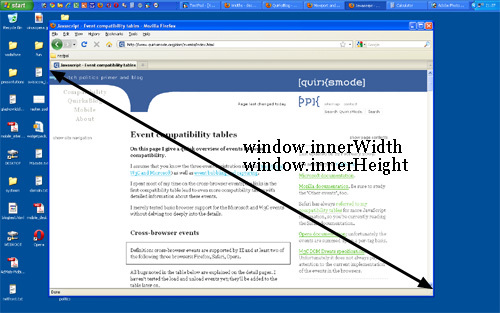 But aren’t the dimensions of the viewport width also given by window.innerWidth/Height? Well, yes and no. 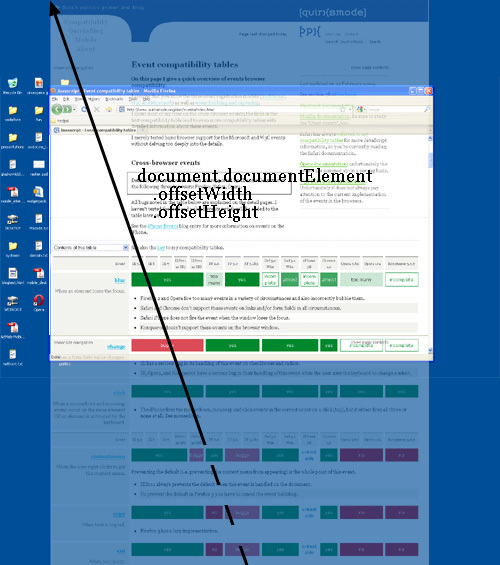 There’s a formal difference between the two property pairs: document.documentElement.clientWidth and -Height doesn’t include the scrollbar, while window.innerWidth/Height does. That’s mostly a nitpick, though. The fact that we have two property pairs is a holdover from the Browser Wars. 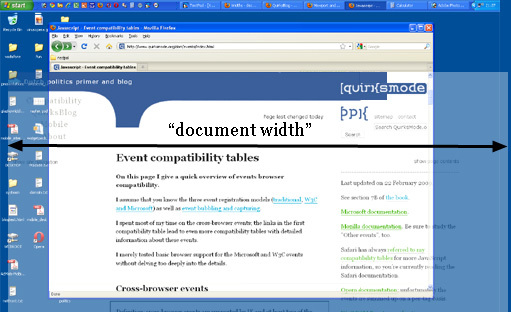 Back then Netscape only supported window.innerWidth/Height and IE only document.documentElement.clientWidth and -Height. 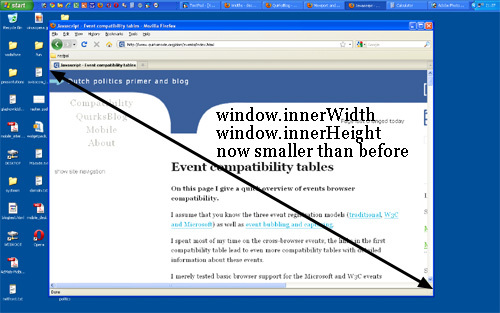 Since then all other browsers started to support clientWidth/Height, but IE didn’t pick up window.innerWidth/Height. Having two property pairs available is a minor nuisance on desktop — but it turns out to be a blessing on mobile, as we’ll see. Dimensions of the <html> element (and thus of the page). 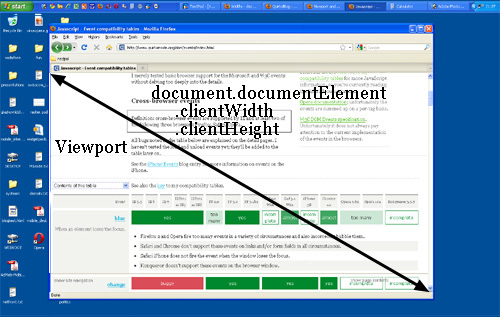 IE measures the viewport, and not the <html> element. So clientWidth/Height gives the viewport dimensions in all cases. But where can we find the dimensions of the <html> element itself? They’re stored in document.documentElement.offsetWidth and -Height. These properties truly give you access to the <html> element as a block-level element; if you set a width, offsetWidth will reflect it. IE and Opera calculate screenX/Y in CSS pixels. pageX/Y gives the coordinates relative to the <html> element in CSS pixels. clientX/Y gives the coordinates relative to the viewport in CSS pixels. screenX/Y gives the coordinates relative to the screen in device pixels. 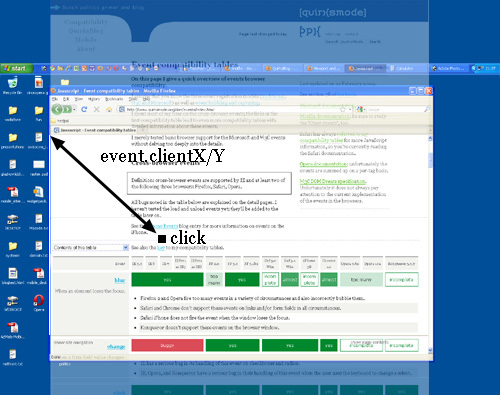 You’ll use pageX/Y 90% of the time; usually you want to know the event position relative to the document. The other 10% of the time you’ll use clientX/Y. You never ever need to know the event coordinates relative to the screen. 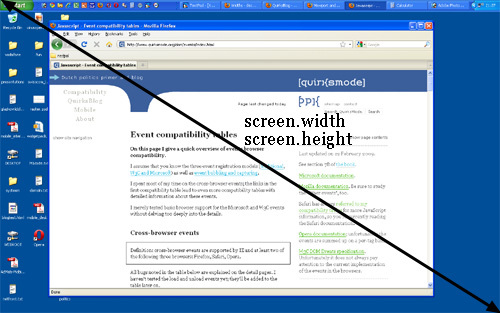 For device-width/height Firefox uses the values screen.width/height would have if they are measured in CSS pixels. For width/height Safari and Chrome use the values documentElement .clientWidth/Height would have if they are measured in device pixels. Now the sidebar is 300px wide, except when the width is smaller than 400px, in which case the sidebar becomes 100px wide. The question is of course: which width are we measuring here? 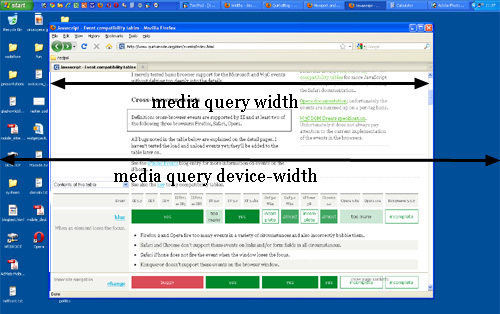 There are two relevant media queries: width/height and device-width/device-height. 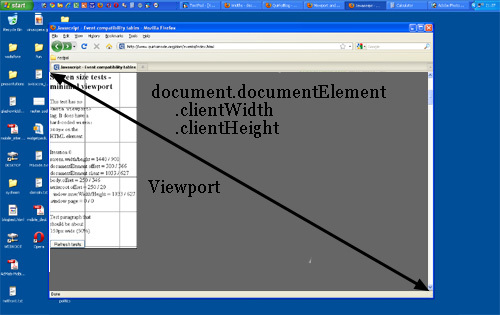 width/height uses the same values as documentElement .clientWidth/Height (the viewport, in other words). It works with CSS pixels. device-width/device-height uses the same values as screen.width/height (the screen, in other words). It works with device pixels. Which should you use? That’s a no-brainer: width, of course. Web developers are not interested in the device width; it’s the width of the browser window that counts. So use width and forget device-width — on desktop. As we’ll see, the situation is much more messy on mobile. That concludes our foray into the desktop browsers’ behaviour. The second part of this series ports these concepts to mobile and highlights some important differences with the desktop.